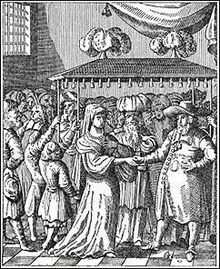 A collection of posts about huppah traditions. 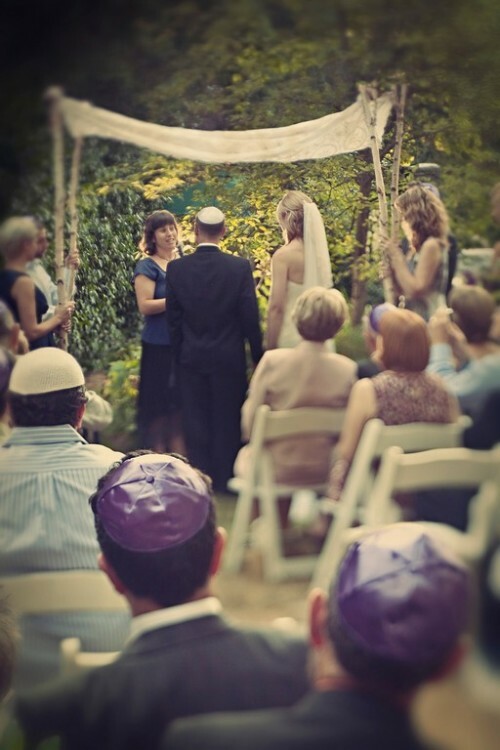 Huppah, huppa, chuppah, khupa – Which spelling is right? All these spellings are correct, and you might even see others. The word originally comes from Hebrew, and the Hebrew alphabet has some letters and sounds that English doesn’t have. Different people substitute English letters for the Hebrew letters in different ways. We like the spelling “huppahs” because the English sounds in “huppahs” are closest to the Hebrew pronunciation than the English sounds of other spellings, like “chuppahs” or “khupas.” We also like huppahs because it is the spelling used in our favorite Jewish wedding planning book, The New Jewish Wedding by Anita Diamant. The first letter: Het. The first letter is the letter on the far right (Hebrew is written right to left, unlike English, which is written left to right). This letter, called het, makes a sound that doesn’t exist in English. It’s a kind of raspy, rolling h sound that you make with the back of your tongue against the roof of your mouth. If you’re not a native Hebrew speaker it can take some practice. If you haven’t heard a Hebrew speaker pronounce it, the sound is difficult to get just from a written explanation. Second letter: Vav. The second letter from the right, vav, can make three different sounds depending on the word. It can sound like the English v, or the long vowel sound o, but in “huppahs” it makes a sound like the English u. Third letter: Peh. This letter sounds like the English p. When our word is written in English, it is most often written with two p’s, although you’ll sometimes see it with one p.
Last letter: Hay. In our word, the letter hay has a soft “ah” sound which some people write with an ah and some people write with just an a. We hope we’ve explained all this in a way that makes sense. Now, the difference between making nouns plural in English and Hebrew is a whole other can of worms. That post will have to wait for another day.